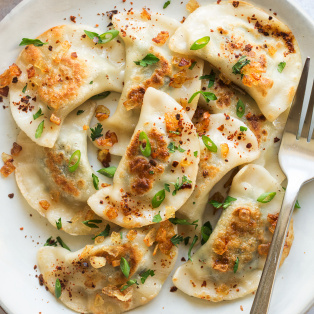 I don’t know if you have ever had a chance to try Polish pierogi, but they are one of my favourite winter comfort foods, so I’ve decided that it is high time for this recipe. As I mentioned several times before, my Gran was a pierogi master in our house and, as she lived downstairs from us and looked after us when my parents were working, I ate heaps of delicious pierogi as a child. In fact, pierogi remind me of my Gran so much that whenever I make a batch myself I suddenly miss her a little bit more. 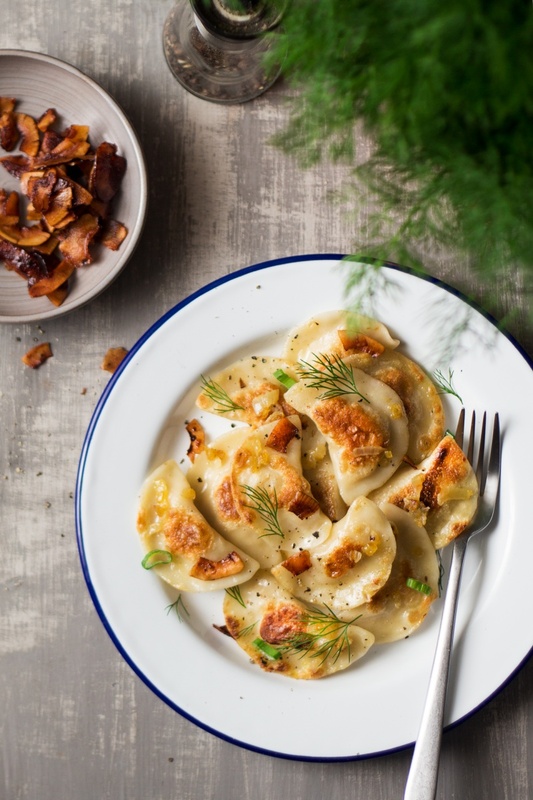 As they are perfect winter food, I ‘open’ a pop-up pierogarnia (a place that specialises in pierogi) in my kitchen every winter – something that makes Duncan super happy as he is a massive vegan pierogi fan too. 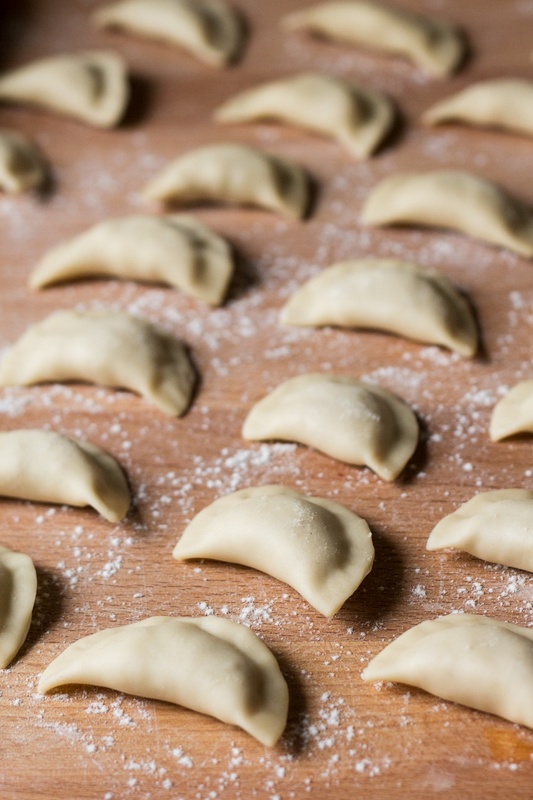 The Poles, as well as Russians (who call their dish pielmieni) and Italians (whose world famous ravioli needs no introduction) all ‘stole’ the idea of wrapping a filling in a piece of thin elastic dough and boiling it from the Chinese. 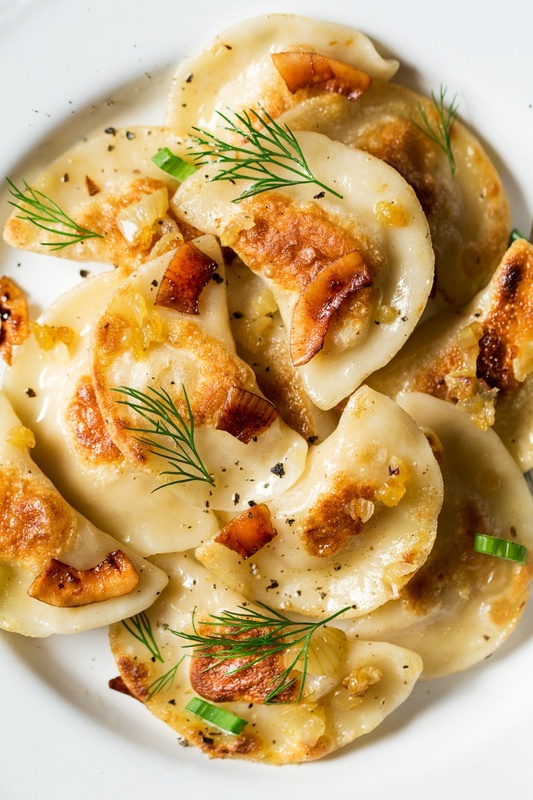 It’s quite ironic as many Polish people consider pierogi to be a quintessentially Polish dish. Anyway, I digress, my apologies. Back to pierogi, so traditionally Ruskie (which is what we call them in Poland) pierogi are topped with lardons and / or fried onion. I obviously always go for the latter, but recently a new idea struck me and I decided to see what they will taste like with…wait for it…coconut bacon 🙂 . I know, I know, it’s a little unorthodox of me, but hey, when you are vegan you are by definition not very traditional anyway, so the horse has already bolted on that one 🙂 . I think it really works well as coconut bacon doesn’t really taste of coconut at all. It tastes salty and smokey with a hint of sweetness, a perfect contrast to the savoury potato and ‘cheese’ filling. Smacznego! PS: If you make my vegan pierogi, don’t forget to tag me on Instagram as @lazycatkitchen and use the #lazycatkitchen hashtag. 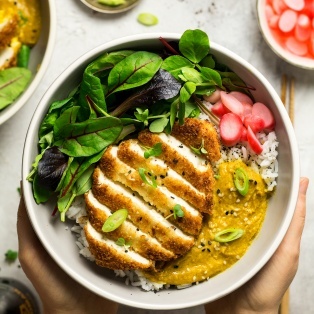 I love seeing your takes on my recipes! Heat up the olive oil in a medium pan. Gently fry diced onions until translucent and lightly caramelised. Some of them will go into the filling and the rest will be used as topping. Put cooked potatoes through a potato ricer. It is best to cook them the day before as it will make the filling hold together better. 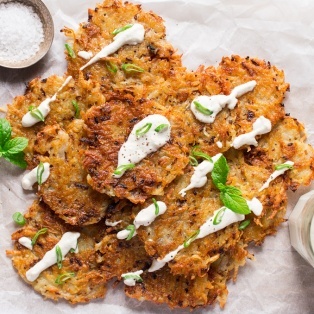 In a bowl, combine mashed potatoes, vegan ricotta and about a ½ cup of sauteed onions. Season with salt, pepper, lemon juice and nutmeg (if you like). Mix in very well and set aside. In a mixing bowl, combine flour and salt. Add ¼ cup of the aquafaba and 2 tbsp of olive oil. Mix well and add about 1 cup of hot water. Once combined roughly with a wooden spoon, start bringing the dough together with your hands. If after a little bit of kneading the dough isn’t holding together (initially it’s supposed to be a bit dry to the touch but hold together), it may need a bit more hot water. It is very important to add the water in very small amounts as too much water will negatively affect the dough. Knead it for about 5-10 minutes with your hands (after kneading the dough should become very smooth and elastic, but not sticky) and then set aside for 30 minutes under a damp kitchen towel so that the dough doesn’t dry up. Once the dough has had a chance to rest, grab 1/6 of the dough and roll it out with a rolling pin on a lightly floured surface. You want it to be about 1-2 mm thin; the thinner the dough, the tastier the dumplings. 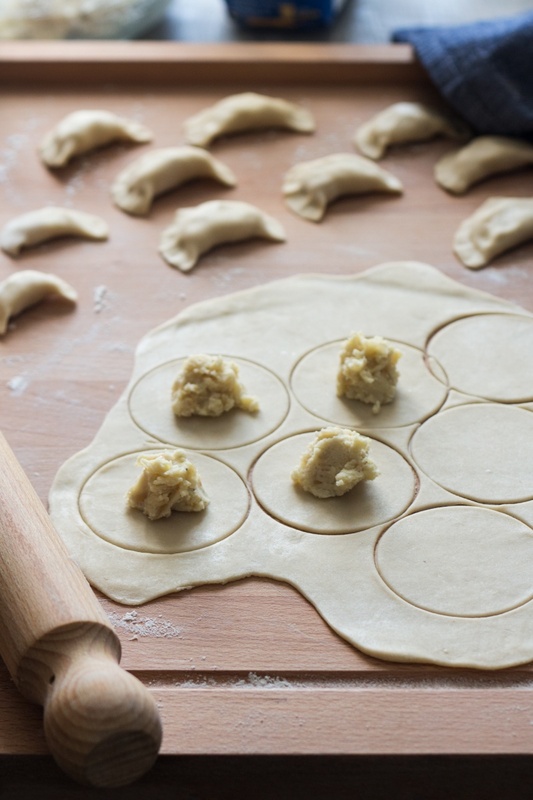 With a cookie cutter or an upside down glass, cut out circles in the dough. Place a heaped teaspoon of the filling in the centre of each circle, fold the circle in half and press the edges of the semi-circle together with your fingers. Go over each dumpling twice to make sure everything is sealed completely. Put the finished dumplings on a lightly floured surface and cover them with a damp kitchen towel while making the rest so that they don’t dry out. Continue in the same way until you’ve used up all of the dough or the filling. Bring a medium pot of water to boil. Once the water is boiling, throw in 10 dumplings at a time and from the moment the water comes to the boil again cook for 5 minutes (depending on how thick your dough is). Once the time is up, fish them out with a slotted spoon and place on a clean plate. Put a new batch in until you have cooked them all. OPTIONAL STEP: Heat up a little olive oil in a pan and place the cooled-down (they should be cold!) dumplings in the pan. Turn them after they’ve browned on one side. Make sure you don’t overcrowd the pan. Whilst you are frying your dumplings, warm up the rest of your sauteed onion, season it with salt and pepper and serve with your dumplings. Heat up the oven to 100° C / 210° F and line a baking tray with a piece of baking paper. In a bowl, mix olive oil, maple syrup, liquid smoke and soy sauce together. Coat coconut flakes in the marinade and marinate for 10-20 mins. Spread marinated coconut flakes on the prepared baking tray making sure individual pieces do not overlap or touch (as much as possible). I did them in two separate batches as the more room they have, the more crispy they will be. Bake for about 15-20 minutes. 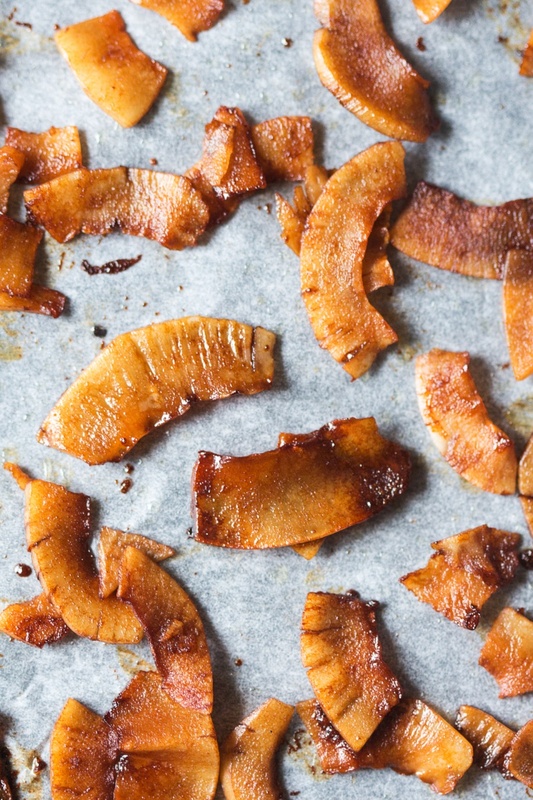 ‘Bacon’ flakes will get more crispy as they cool. Store in an air-tight container. *My coconut bacon flakes did not retain their crispiness for very long but I live by the sea, in a high humidity environment, so I’m hoping it is just me. They are still tasty even once they lose their crispiness. I grew up eating my grandma’s pierogi on Christmas Eve and Easter every year. I haven’t had a single pierogi in years since going vegan as I haven’t conquered the laziness to make them myself, so I commend your effort! The recipe seems surprisingly simple so I may just have to give them a go. But in the meantime I can definitely keep drooling over these pictures of yours. They’re stunning! I’m half polish so my love for pierogis is huge! 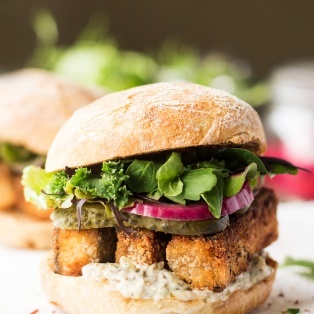 Love that you veganized them and added coconut bacon! They look irresistible! Thanks Ola. I’ve edited the description. Hi! These look amazing. Have you tried to freeze them? How do they turn out? I used this recipe and it is amazing! Thank you so much for sharing it! I just wanted to make a note that in the first line of the dough recipe, it says to use a 1/4 of the aquafaba. I read this as ise a quarter of what the recipe calls for vs. A 1/4 cup of aquafaba and tottally dodnt realize the error intil my dough was completely mixed up and it failed miserably. I just wanted to let you know incase anyone else tead it the same way I did. 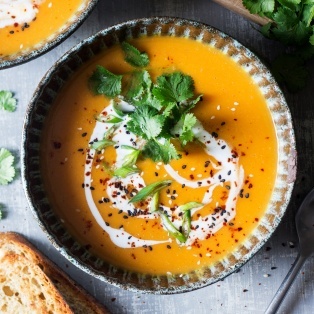 Otherwise a supreme recipe that I’ll be using again and again and again! I just saw your recipe and I wonder what you mean by ‘reduced’ aquafaba. This pierogi has become a staple of our diet. I make a big batch and freeze it then! I stopped scrolling when I read “Coconut Bacon” and immediately hit “PRINT.” LOL . YUM! Thank you for sharing. This sounds absolutely delicious! Omg jakie piekne!!!!! Robie koniecznie!!! Hi! I’m super excited to make these! I grew up eating pierogies but since becoming vegan haven’t been able to have any. Can these be frozen in large batches? What is Aquafaba? I’m a newer vegan and I’ve never heard or it. In the comments some talked about the consistency of egg whites- can I use Veganegg by follow your heart? 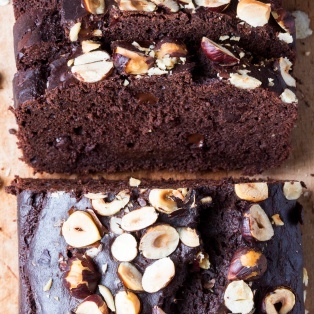 Just wondering if you’ve tried making these with gluten free flour?